Since its launch in 2002, the charity, Tag Rugby Trust (TRT) has grown and evolved into an organisation working in the UK and numerous developing countries. TRT uses rugby as a vehicle to ‘Build Futures’ by providing relevant and challenging opportunities for children and adults alike. Sustainability and local ownership is central to how TRT runs its projects. 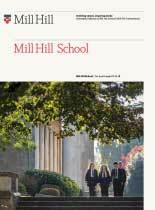 Mill Hill has been in partnership with the charity for a number of years. We annually offer our Lower Sixth pupils an opportunity to travel to Zambia to work with local teachers in order to deliver Tag Rugby coaching to government primary schools and orphanages over a two week period, both in the copper belt town of Ndola and in Livingstone. After a week of coaching, our pupils take on the responsibility of organising ‘Tournament Day’ when all the schools come together to compete for the Mill Hill Trophy at the end of each week. The trip never fails to offer our pupils new experiences, open their eyes to a new culture and create memories that will last a lifetime. Learn more about TRT at www.tagrugbytrust.co.uk.